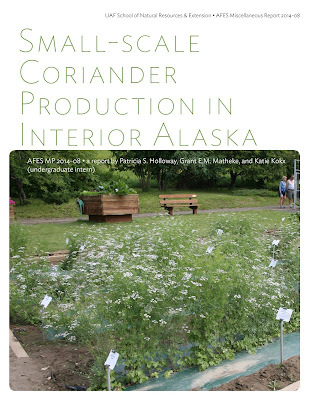 "Small Scale Coriander Production in Interior Alaska" a new publication of the Agricultural and Forestry Experiment Station, describes research aimed at determining whether coriander can be grown as a seed crop in Alaska. The report's authors are Professor Pat Holloway, horticulturist Grant Matheke and Katie Kokx, a former undergraduate intern. Coriander is a spice that is used in Asian, Middle Eastern, North African, Mexican and South America cuisines, and it is grown and harvested commercially in many parts of the world. The plant’s leaves are sold as the culinary herb cilantro. Coriander has been grown in Alaska for many years, but a gourmet food company in Fairbanks was interested in whether commercial quantities of the seed could be grown in Alaska and developed as an all-Alaska product. 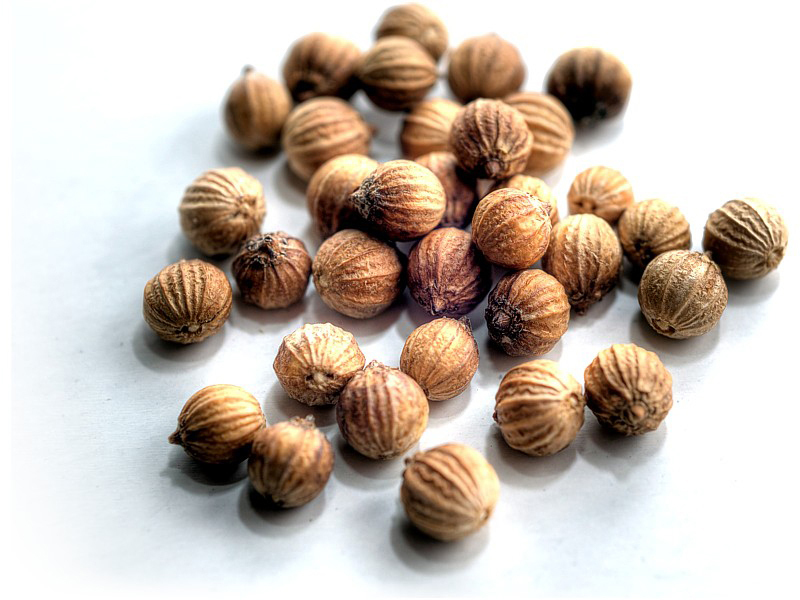 According to the report, seven coriander cultivars from a U.S. Department of Agriculture coriander collection were grown in the Georgeson Botanical Garden. The plants, including seed heads, were harvested and cleaned by hand, a tedious process. The report concludes that small-scale seed production is feasible in Fairbanks for the gourmet market, but investment in equipment for large-scale production is probably not feasible. See the report on the SNRE publications site. Coriander is a two-seeded fruit with a hard, nut-like covering.